As you see, rather than carrying around an unwieldy laptop or a separate MP3 player, it's worth considering to transfer MP3 to iPhone so you can always pocket your music library on the go. And iTunes is always the first choice until you get into troubles. For example, you did do the right steps but failed without reason; or your iTunes raw music files are erased on computer after you synced MP3 to your iPhone, which is undesired for most of the users. That's why how to transfer MP3 from Mac to iPhone without iTunes is so frequently searched. Fortunately, there is an easy but effective iPhone transfer tool to transfer music to iPhone without iTunes, which is to use MacX MediaTrans. Read on to get the details. MacX MediaTrans is a superb all-in-one iOS manager that you can organize, delete, and transfer data between iPhone iPad and Mac computer. It gives you a lot more control over your music than iTunes does, and allows you to share purchased music within even different Apple IDs. You can easily sync MP3 to iPhone not only from your computers but also your friends' or families' Macbook Pro/Air, iMac, Windows PCs, Android gadgets. Here comes more features of the MacX MediaTrans you may interested in when syncing music to iPhone. Support more than MP3, but M4A, AAC, WMA, FLAC etc., which will be automatically converted to MP3 when importing music to iPhone from computers. Two-way sync, it not only allows you to copy MP3 to iPhone, but also transfer music from iPhone to Mac without earsing data at both ends. Remove songs DRM and convert Apple Music M4P/M4B to MP3 when exporting iTunes purchases from iPhone for sharing without Apple ID limits. Support a wide range of iDevices, namely iPhone XS (Max)/XR/X, iPhone 8/8 Plus, iPhone 7/6s/6/Plus/5s, and iPad/iPod. Compared that iTunes only transfers purchased music, this iTunes alternative has an access of all music files, regardless of YouTube, SoundCloud, Pandora download music, cloud service saved music, ringtones, audiobooks, or DVD ripped audio files and so on. Make ringtone for iPhone in MP3. It's an iPhone ringtone maker to turn any music to ringtone in MP3, surviving you from the dull official iPhone ringtone. 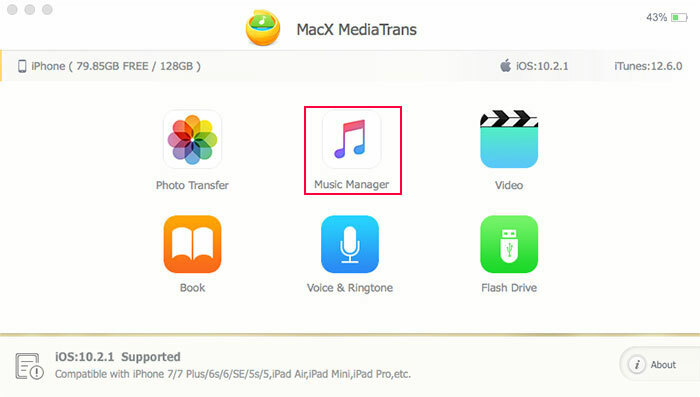 [Tutorial] How to Transfer MP3 to iPhone without iTunes? To copy and move MP3 audios to iPhone without iTunes, your iPhone with the USB cable, one computer (Mac or Windows), and MacX MediaTrans are required. Firstly, free download MacX MediaTrans and launch it on your computer, and now you can sync MP3 files from Mac or Windows PC to iPhone 8 or iPhone X within 3 steps. Step 1: Connect your iPhone (iPhone XR/XS/X/8/7/6S/SE/5S etc.) to Mac with the USB cable. 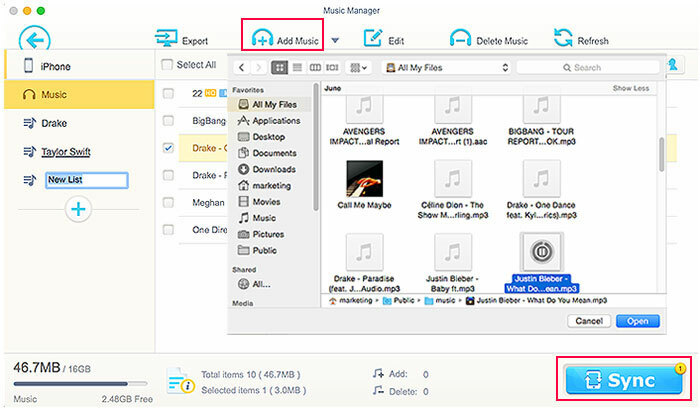 Click "Music Manager" icon to get an access of all your iPhone music files on Mac. All the music files will be loaded in a blink time. Step 2: Click "Add Music". Select MP3 files you wanna copy to iPhone from your computer. Then click "Open" transfer selected MP3 to your iPhone. Step 3: Click "Sync" icon to import MP3 from Mac to iPhone XR or iPhone XS/XS Max without iTunes in blazing fast speed. Maximumly 3 seconds only for 20 songs if your Mac computer is hardware acceleration available. Of course, you can sync MP3 music to iTunes library for playing on iPhone. Before everything, you need make sure you have the latest version iTunes installed on your Mac or Windows PCs. Step 1: Plug into your iPhone XR/XS (Max) or eariler iPhone model to computer with USB cable and run iTunes. Step 2: Go to "File > Add File to Library/Add Folder to Library". This will import the MP3 files that you want to iTunes. Step 3: Click "Music" from the left-side menu and check "Sync Music", you can choose "Entire music library" or "Seleted playlists, artists, albums, and genres". Then click "Apply". 1. It does transfer MP3 to your iPhone, but you will lose your existing music of iTunes Library on Mac computer. 2. 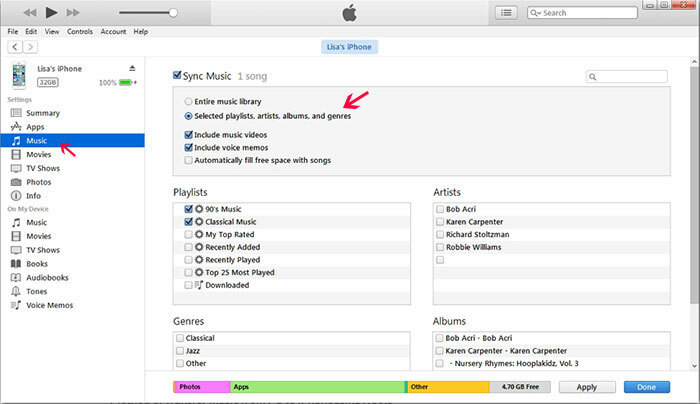 You cannot select specific songs by iTunes, only according to playlists, artists, albums, or genres. 3. Only the music purchased from iTunes Store can be transferred from Mac to iPhone. If you'd like to import any music downloaded from online, ripped from DVD, CD, or stored in Google Drive, Dropbox, iCloud, iTunes won't sync non Apple music to iPhone. 4. If you have hit the 5 computer authorition cap, you cannot use iTunes to transfer MP3 unless you deauthorize the previous computers. 5. You can't sync MP3 to iPhone from different computers. If your iPhone is synchronized with one computer, you are not allowed to transfer music to iTunes from another computer. Or else you will be reminded to erase everything on your iPhone so as to sync with another iTunes library. To avoid the possible troubles when adding MP3 to iPhone, you are persuaded to import MP3 to iPhone without iTunes. Tools like Dropbox, Google Play Music, Amazon Cloud Player, Media Monkey etc. are all available to do so, but MacX MediaTrans is still highly suggested since it's awfully easy to transfer files in two-way without erasing; it allows you to transfer music with all formats, including MP3, M4A, WMA or FLAC, transfer data selectively with original quality preserved etc. The iPhone music manager, MacX MediaTrans, can easily copy and add MP3 songs to iPhone without erasing old iTunes syncs and organize, edit song titles for iPhone, like albums, artists, titles, playlists, make ringtones for iPhone and auto convert music to iPhone audio format.